Guest Post – From Formula to Breastfeeding Pro!! I am a 32 year old mother of 4 beautiful children. I started having babies quite young – I was 20 when my first son was born. He was born via ’emergency’ c-section, which I now believe to be a ‘let’s get her out of here’ c-section. I was in labour for over 24 hours, opted for the epidural and was exhausted. I had absolutely no energy to push out a fart let alone an 8 lb. baby. He was healthy and perfectly fine. I chose to breastfeed, but had no support. 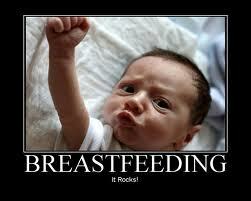 A first time mother needs support with breastfeeding. My mother (who we lived with at the time) was completely against breastfeeding. I was a first generation Canadian, and to her, breastfeeding would have me “stuck to the baby at all times” and I “wouldn’t be able to do anything” (her unforgettable words). The baby came down with a case of slight jaundice and I was instructed by the doctor to refrain from breastfeeding for a few days and feed the baby pedialyte. I didn’t know what that was – and my mother, in her ‘I told you so’ voice, said “it’s formula”. So I listened to her. My initial plan was to go back to breastfeeding in a few days. But with the ‘ease’ of formula feeding and difficulty of expressing milk with a hand pump, the initial plan never happened. At the time, I never really thought about it. I was young and naive. Now, I am heartbroken over the time that my first child and I ‘lost’. Sometimes, I inwardly get upset with my mother – but I know that she had good intentions. It was what she knew. Her family came to Canada for ‘freedom’ and ‘independence’ – and the bombardment of formula advertisements in the 70’s fed the immigrant’s ideology of that freedom. So, we live and we learn. Life moves on. In 2002 (four years later), I gave birth to my second son via a ‘planned’ c-section. There was “absolutely no way I could deliver a 10 lb. baby after seeing what happened the first time”. Don’t get me wrong, though. My female OB told me that I was MORE than welcome to attempt a natural birth a.k.a. VBAC. She also followed up that speech with a handout that explained the ‘risks’ of a vaginal birth after c-section, which is pretty much summed up like this: ‘you could try, but if you do, you could tear your uterus which would result in us having to remove your uterus, which would mean no more babies for you, OR your baby could die, OR you could die’. Ummm… where do I sign for a scheduled c-section? Anyway, he was born and after a day old, he was brought to Sick Kids Hospital in Toronto. He had a ‘meconium pseudocyst’ that resulted in him needing surgery. Meconium leaked from a perforation in his intestines and caused serious infection in his abdomen. =( He was given an ileostomy, and for the first 9 months of his life, he wore a stoma bag. This time, regardless of the obstacles that we were faced with, I was determined to breastfeed. The staff at Sick Kids were amazing in a sense that they let me know about the electric breast pumps that were available in the hospital. Even though baby wasn’t taking food by mouth, I was able to borrow these amazing pumps (that are FAR from the manual pumps) that kept my milk supply up to speed. We also were building quite a supply for when he was able to start taking food by mouth. We were also able to borrow pumps when we went home – to return when we went back in the morning. At this point, we had our own apartment so, all of this ‘alternative’ style of living was not subject to any judging. When the baby could finally feed, it was beautiful. We had absolutely no problems at all. Despite him not suckling for almost a month, he was a pro… and so was I. This was the beginning of a beautiful journey. He nursed… and nursed… and nursed. He loved ‘bubbahs’! LOL! By the time he was two years old, I had the urge to wean. I was getting frustrated and at times annoyed. I learned that it was a natural feeling when it is time to wean. He had such a difficult time with it – and I felt horrible and so guilty for feeling the way I did. I got pregnant again – and we nursed through the entire pregnancy. I refused to have another c-section, so searched all over the city for a midwife. A few midwives turned me down because of my history, but with some research, I found someone who supported VBACs and actually had 2 VBACs herself! Everything went perfectly. My daughter was born at home in a birthing pool and she too, nursed like a pro. I tandem nursed for a few weeks and then had to explain to my 2 year old that he was a big boy now. It was such a bittersweet time. My daughter nursed… and nursed… and nursed. By the time she was two years old, I was ready to have my fourth child. He was also born at home in water and nursed like a pro. =) He nursed… and nursed… and nursed. My daughter shared ‘bubbies’ with the baby for a few weeks until it was time for her to be a ‘big girl’. ‘Bubbies’ (which was previously ‘Bubbahs’) then became ‘Mummies’. The baby nursed until he was three years and seven months old. Just so happens that my husband and I had an opportunity to go to Cuba soon after. We had never been on vacation – EVER… because we were “stuck” to the babies. I had been nursing for over eight years STRAIGHT! Wow. Even just typing it gives me chills. I am proud of my choices. People thought I was crazy – especially when I was nursing through pregnancy. But that was my choice – and it felt like the right thing for me to do. In all honesty, I was unsure about how the milk production process would work – but the human body is amazing! I produced regular milk right up until the babies were born. Then it changed to the colostrum-y milk that newborns need… and apparently ‘tastes different’ (lol) to toddlers. I should also add that we are co-sleepers. =) Every single one of my children slept with us in our bed since birth. We had cribs every time (except for the last baby, when we admitted to ourselves we weren’t going to use it), but the babies would sleep with us. We went from a queen bed on a frame… to a queen mattress on the floor… to a queen mattress and a twin mattress on the floor… to a king mattress and a queen mattress on the floor. LOL… We also practice alternative health/medicine, eating and living. Anyway, back to the story at hand: the trip to Cuba was significant. I never thought about it at the time, but it marked a new stage of my life. I had never been on vacation before and I had given so much of myself (unquestioningly) to my children. I went away and came back to a new me… and a new us. I thought I would be mortified when I was through with nursing – but I haven’t even shed a tear. I get a a little sad… but it’s more like a melancholy happiness – if that makes sense. We are just at another stage of our journey together, and those memories – of birthing and nursing babies… living life together… is what matters. I wouldn’t change anything at all. Phew! That was a mouthful! Hope you’re still awake! lol… It was great typing it out like this. I have never done it, and it made me remember the wonderful times my family had together. Thank you for that opportunity. Thank you Nerissa for sharing your story with us. If you’d like to find out more about Nerissa her Twitter name is @TheCupcakePlace. Her blog ishttp://thecupcakeplace.wordpress.com/ and after reading a few posts I wish I lived in Canada and could find some of her yummy looking cupcakes – I’m a little hungry now! Do YOU have an eco-minded article you would like to submit? Email it to theecochic@gmail.com and I will try to add a guest post each week.